Yam Leaf Bistro is primarly a Salvadoran restaurant, but they also have other Latin American dishes. We had their “Yucca Bolitas” for appetizer, which were fried creamy yuca balls with crispy skin (fried) and mozzarella cheese filling. Salsa and guacamole were also served on the side. 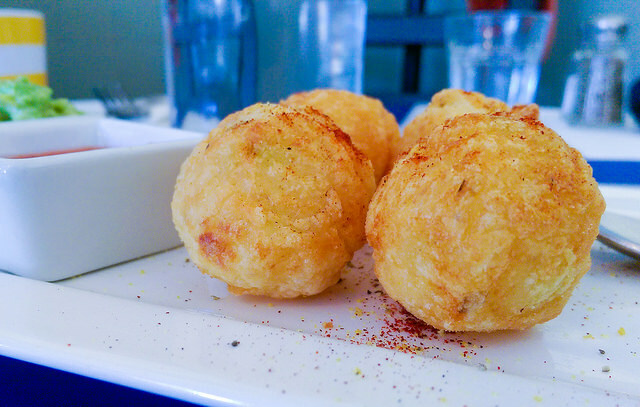 The yuca balls were lightly fried and soft as well. Each bite pulled the mozzarella from the center (filling). The yuca, which I had for my first time, tasted like sticky potato. In the Caribbean region of Colombia, cassava is also eaten roasted, fried or boiled with soft homemade cheese or cream cheese and mainly as a garnish of fish dishes. Yuca, mandioca, or cassava is an extremely versatile ingredient and can be cooked in so many different ways. You can fry it, boil it, bake it, mash it, steam it, and even grill it. It can be used to make empanada dough, dumplings, patties, soups, desserts, and more. You can even use yuca flour as a replacement for regular flour! I’ve got a great recipe that combines some of my favorite ingredients, yuca and cheese, into one perfect bite. 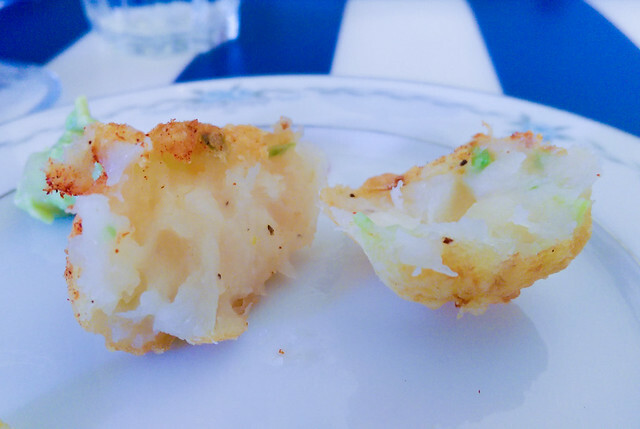 These crispy little Yuca Balls Stuffed with Cheese are a fabulous party snack or side dish. To make them, the yuca is cooked over medium heat until very tender, then mashed into dough, stuffed with cheese, formed into round balls, and then fried again until crispy. And the best part? You can make them ahead and freeze them. Just fry them over when guests show up (or you get a craving that won’t quit!). I make the balls ahead of time, during those afternoons when I have a few extra minutes, then fry them straight from the freezer. Whenever you need them, you can whip them up for a quick and delicious appetizer. Buen provecho!